Blasphemy and accusations of the crime have led to the deaths of dozens of people in Pakistan since 1990. Rights groups have repeatedly criticised and called for the reform or repeal of the country’s controversial blasphemy laws, which date back to the British empire. The Islamabad High Court asked parliament on Friday to make changes to the current decree to prevent people from being falsely accused of the crime, which is punishable by death if the Prophet Muhammad is insulted. Other punishments include a fine or prison term, depending on the specific offence. In a lengthy 116-page order, Justice Shaukat Aziz Siddiqui suggested that parliament amend the law to require the same punishment of the death penalty for those who falsely allege blasphemy as for those who commit the crime. “Currently, there is a very minor punishment for falsely accusing someone of blasphemy,” the judgement said. Under the existing law, the false accuser faces punishments ranging from two years in prison to life imprisonment. Mehdi Hasan, chairman of the Human Rights Commission of Pakistan, welcomed the Islamabad court’s move seeking amendment for the law. “This law is being misused by people to take revenge against their opponents, and it is very easy to charge anyone for blasphemy,” he told Al Jazeera from Lahore. Friday’s ruling noted that some critics are demanding the law be abolished but Siddiqui argued that it’s better to stop the law’s exploitation rather than get rid of it. A majority vote in the provincial assemblies is required for the law to be amended. Backing of that vote by the federal government would likely be needed for the Senate to move. Decrees in Pakistan are derived from the British common law, but the constitution holds that no laws shall be passed that are against the teachings of Islam. After previous unsuccessful attempts to amend the blasphemy laws, legal experts offered little optimism over the new recommendation. “Blasphemy is a very difficult topic, and any small change will be opposed by the right when they feel like it’s being watered down and by the left when they feel it’s being made stronger,” Angbeen Mirza, a lawyer based in Lahore, told Al Jazeera. In late January, Pakistan’s Senate officially took up the issue of the law’s potential misuse for the first time in 24 years. Analysts say previous attempts at reviewing the law have been thwarted by the pressure of religious parties who, along with most in society, see it as “equivalent to religion” in the country. “The religious right is on the offensive in Pakistan and because of the apologetic attitude of all governments they do not take a stand,” Hasan said. Legal experts say instead of repealing the law, legislation to curb false accusations and hate speech is required to deter the decree’s exploitation for personal gains. “An accusation of blasphemy hardly ever results in legal process,” Mirza said. She added: “The justice system is slow and provides no protection, leaving the accused at the mercy of the people”. Aarafat Mazhar, an independent researcher of Pakistan’s blasphemy laws, said there is a tendency in the country to resort to public accusations rather than formally registering a case. “Labelling a specific person or a community as being a blasphemer or just being anti-Islamic in general can be a death sentence and is a cause for disruption in public order,” he said. Tahir Mahmood Ashrafi, a religious cleric and chairman of the Pakistan Ulema Council, said while there can be no room for change in the existing law, a review to prevent its misuse should take place. However, beyond legal parameters, it is thought that a culture of intolerance towards free speech and religion is at the root of the problem. In a December 2016 report, rights group Amnesty International condemned Pakistan’s blasphemy laws for “violating human rights” and called for their abolition. 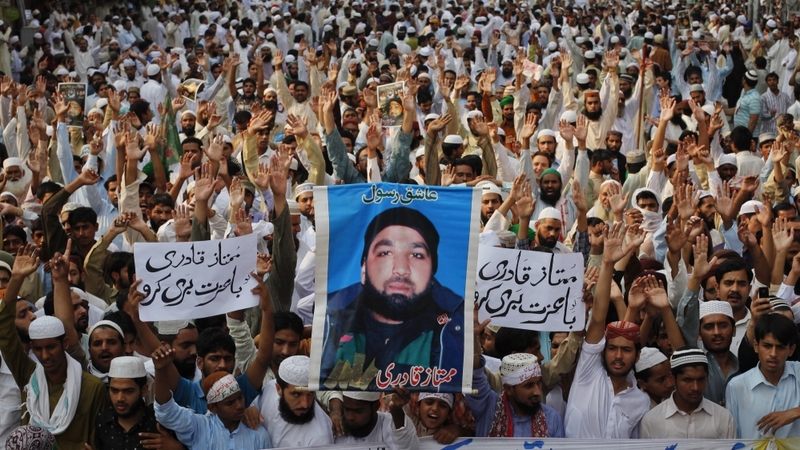 While not a single convict has ever been executed for blasphemy in Pakistan, currently about 40 people are on death row or serving life sentences for the crime, according to the United States Commission on International Religious Freedom. Increasingly, however, right-wing vigilantes and mobs have taken the law into their own hands, killing at least 69 people over alleged blasphemy since 1990, according to an Al Jazeera tally. In two prominent cases in 2011, Salman Taseer, governor of Punjab, and Shahbaz Bhatti, minorities minister, were both assassinated within two months of each other for asking for the law to be reformed. Taseer’s killer and bodyguard, Mumtaz Qadri, was hanged in February 2016. Ashrafi blamed the judiciary’s failure to hand down timely judgements for the rise in public tensions. “When the punishments are not given, or the judgements are not passed on time, then people get an opportunity to take the law in their own hands,” he said. Academic circles in Pakistan advocate more research and urge authorities to learn from the example of other Muslim countries. “The point is to make sure that our laws are aligned with the fundamental rights promised in the constitution,” Mazhar said. WATCH Inside Story: Should Pakistan’s blasphemy laws change?